1. 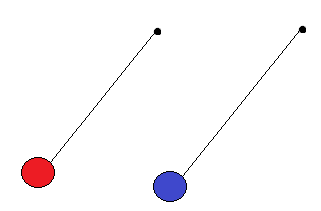 Two pendula of slightly different length oscillate next to each other. The short one oscillates with frequency 0.52Hz and the longer one with frequency 0.50Hz. If they start of in phase determine their phase difference after 75s.2. A stone is dropped into a pool of water causing ripple to spread out. After 10 s the circumference of the ripple is 20m. Calculate the velocity of the wave.